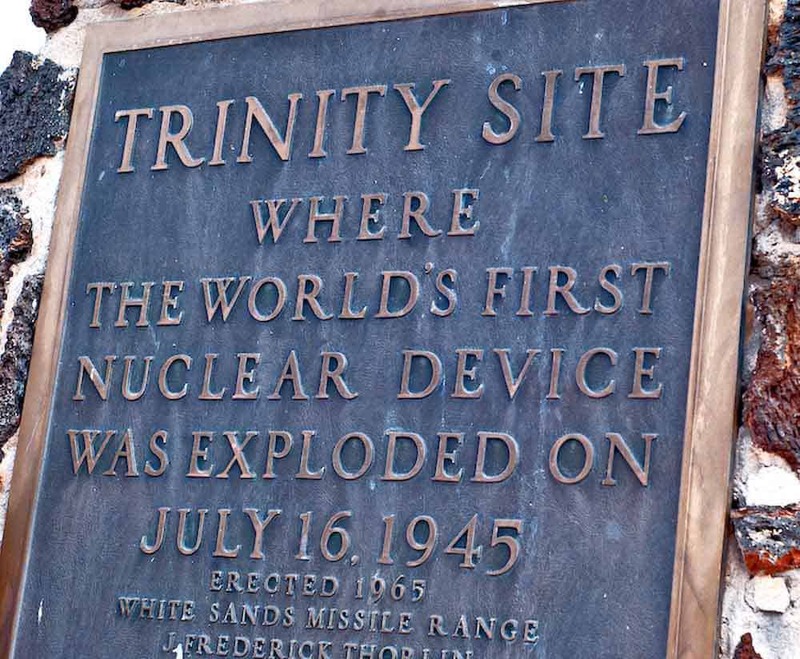 The Trinity Site is where the first atomic bomb was tested at 5:29:45 a.m. Mountain War Time on July 16, 1945. Anyone can drive to the tour on their own. Photo IDs are required. For more info see the Trinity Tour FAQ on the WSMR site. Directions: Stallion Gate Entrance – Exit I-25 on mile marker 139 (San Antonio, N.M.) and head 12 miles east or exit Highway 54 onto Highway 380 and head west 53 miles of Carrizozo, N.M. Turn on the Stallion Gate entrance and head south five miles of Highway 380. On open house days, this gate is open for entrance from 8 a.m. to 2 p.m. Trinity Site closes at 3:30 p.m. Visitors are allowed to enter and exit through this gate unescorted anytime during these special days. There is no food or water or other services along the route, so come prepared. The range is normally closed so this ride must be arranged with the White Sands Missile Range personnel. You must carry picture id on you while on the range. Port-a-johns are available a the gate and at the Trinity site. Riders must not leave the road due to the presence of unexploded ordnance. Photographs may be taken at the Trinity Site but not anywhere else along the route. Dogs are welcome but they must be well-behaved, leashed and picked up after. Bring bags for dog waste. 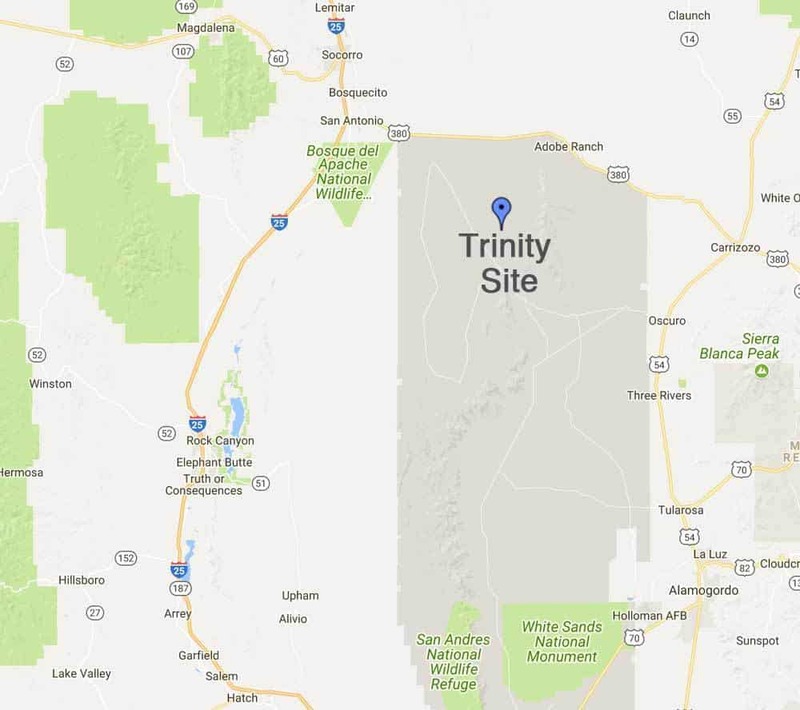 Trinity Site is clearly marked below U.S. Highway 380 on the State of New Mexico highway map. Rides are available from Socorro (call Socorro Public Transportation to schedule your ride: 575-835-1501) and a caravan goes from the Tularosa High School Football Field (more info). Media must register with White Sands Missile Range PAO via email: usarmy.wsmr.atec.list.pao@mail.mil.